Ryan Truex picked up the 1st last-place finish of his NASCAR Camping World Truck Series career in Friday’s Ford EcoBoost 200 at the Homestead-Miami Speedway when his #81 Chiba Toyopet Toyota fell out with engine trouble after 49 of 134 laps. The finish, which came in Truex’s 19th series start, made him the 12th first-time last-place finisher in 2016. The two-time K&N Pro Series East Champion and younger brother of Martin Truex, Jr. has continued to fight to make a name for himself in NASCAR’s top three divisions. He made his XFINITY Series debut in 2010, his first in Trucks in 2012, and debuted in Cup in 2013. He and fellow newcomer Alex Bowman signed with BK Racing for a run at the 2014 Cup Rookie of the Year, but both struggled. Truex was released by the September race at Loudon, and other than a four-race XFINITY stint for Biagi DenBeste Racing in 2015, had been missing from the grid. This year, Truex signed with Hattori Racing Enterprises, a part-time XFINITY and Truck Series operation owned by Shigeaki Hattori. Hattori, a former open-wheel racer with ten Truck starts as a driver, planned at least a partial schedule with Truex, contingent on sponsorship. During the season opener at Daytona, Truex nearly came up big, finishing a close 2nd to Johnny Sauter when a last-minute caution froze the field. It was far and away the best finish for Hattori, who himself ran no better than 27th in the series, and whose team ran 17th in its only two previous starts. Heading into Homestead, Truex had racked up three more Top Tens: a 6th at Kansas, 8th at Dover, and another 8th at Talladega. No less than ten sponsors signed with the team for one and two-race deals, but still the team was only able to run 15 of the season’s 23 races. Still, the team qualified for each race they attempted and failed to finish just once - at Michigan, where the rear gear failed in the final laps. Following a 21st-place showing at Texas, the team skipped the next-to-last race at Phoenix, then eyed a return at Homestead. Truex was one of 35 drivers who arrived to attempt the 32-truck field for the season finale. Among them was Tommy Joe Martins, whose team labored for a full week to rebuild the truck that wrecked at Texas. Chassis 025, nicknamed “The Unlucky Lady” by Martins Motorsports, made it to Homestead, but was a handful in qualifying. 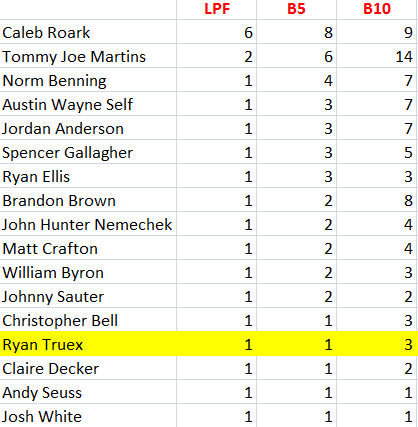 29th in both practices, Martins ended up the fastest truck to miss the show, a half-second short of bumping Austin Wayne Self for 27th. Joining the #44 Boot Daddy / Diamond Gusset Jeans Chevrolet on the ride home were Jennifer Jo Cobb, who was a late entry in her #10 DRiven2Honor.org Chevrolet, and Norm Benning. Benning, once again driving for Mike Mittler in the #63 Strategic Public Affairs Chevrolet, made just eight starts in 2016, his fewest in the series since 2008. Truex, meanwhile, earned a strong 15th-place run in qualifying and had run 17th and 20th in the twin practice sessions. Starting last in Friday’s race was Travis Kvapil, who returned to MAKE Motorsports’ #1 CorvetteParts.net Chevrolet. By Lap 2, 32nd fell to his teammate, Spencer Boyd, in the #50 GruntStyle.com Chevrolet, who after eight laps was already 19.7 seconds behind the leader. Boyd still trailed the field on Lap 15, when the first yellow fell for Stewart Friesen’s spin off the fourth corner in the #16 Halmar International Chevrolet. Friesen fell to last as a result, then climbed ahead of Matt Tifft, who took last on Lap 32 in his #11 Brain Gear / Surface Sunscreen Toyota for Red Horse Racing. Friesen retook the spot from Tifft on Lap 40 and held it until the second caution, drawn by Patrick Staropoli. Staropoli’s night in Bobby Dotter’s #07 Auto Nation Cure Bowl proved a struggle as he drew three of the night’s four cautions for spins and accidents. But for all his issues, he still finished under power, nine laps down, in 31st. Between his second and third incident, Truex had pulled into the garage, having reported smoke in the cockpit. The discovered engine problem proved terminal, and the #81 was done for the night. His turned out to be the only DNF of the evening. Staropoli, Boyd, and Friesen finished 31st, 30th, and 29th, respectively. Rounding out the Bottom Five was Reed Sorenson, who stayed out during the first caution to lead Lap 17, then settled back for a 28th-place finish in Premium Motorsports’ #49 Chevrolet. 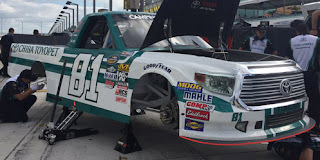 *This marked the first last-place finish for the #81 in a Truck Series race since August 13, 2013, when Ricky Ehrgott’s #81 Platinum Wealth Partners / Rev1 Power Services Toyota was eliminated in a single-truck accident after 2 laps of the Pocono Mountains 125 at Pocono. Click here for access to exclusive bonus content and patron-only gear! 40 drivers start a Monster Energy NASCAR Cup Series race. 38 fill the grid in the XFINITY Series. 32 take the green in Trucks. Yet, even when the field is short, only a handful of these stories are ever told. 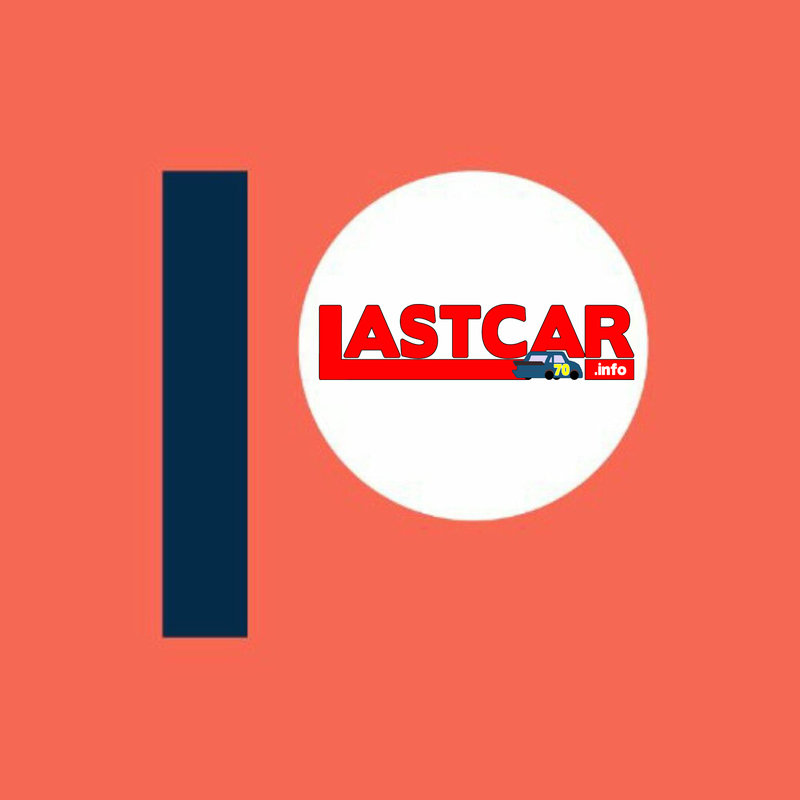 The mission of LASTCAR.info is to fill in these missing pieces one week at a time, especially regarding the least-covered racers in motorsports - the last-place finishers. 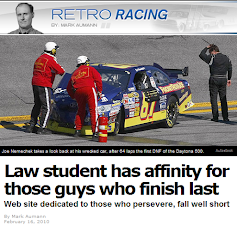 Since 2009, LASTCAR.info has covered the untold "race" for the most last-place finishes in NASCAR history - and, in doing so, continues to chronicle the trials and triumphs of those who race for something more meaningful than victory: survival. New NASCAR articles and statistical updates are added following each Monster Energy NASCAR Cup, XFINITY, and Camping World Truck Series race weekend, plus driver features, historical retrospectives, editorials, and more. 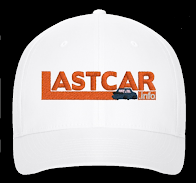 Hats, shirts, bumper stickers, eBooks, and more. Let everyone know which end of the field you watch! Pick up your copy of "J.D. 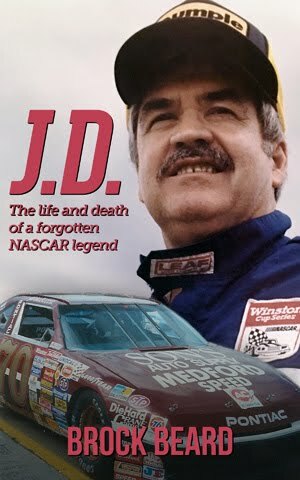 : The Life and Death of a Forgotten NASCAR Legend"
Click this picture for details on how to order the first stand-alone biography of the late J.D. McDuffie. For LASTCAR purposes, including rankings and statistics, a “last-place finisher” (LPF) shall be defined as any single NASCAR driver who, after earning a starting spot in the field for a NASCAR-sanctioned points-paying race against other NASCAR Cup, XFINITY, or Truck Series drivers, was at race’s conclusion classified as the last-ranked qualified driver in the field for said race. This classification must be recognized on official NASCAR results, or failing this, by a preponderance of unofficial sources. Only one driver can be classified as the LPF for any single NASCAR-sanctioned race. So long as the above is met, the LPF can be any one driver classified as such for any reason, including but not limited to (1) a “did not start,” that is, an entrant who qualifies for a starting spot in the race, but for any reason is subsequently unable to start the event, including a post-qualifying driver switch if it is still recognized as the LPF in the results (2) an entrant who encounters an event once the race has started which prevents the driver from finishing ahead of any other qualified entrants, including both DNFs and a driver who finishes under power but laps down, (3) a decision to “start and park” the driver’s entry, (4) a disqualification handed down by NASCAR and/or track officials that subsequently classifies the driver in the final position behind the unofficial LPF. LASTCAR shall not consider the LPF as anything else, including but not limited to (1) the lowest-ranked driver who finishes the race under power, (2) the fastest driver who does not qualify for the event in question, (3) a driver who was originally the LPF, but sometime after the race was usurped for the spot by a disqualified entrant NASCAR and/or track officials classified as the official LPF, (4) a driver who may be categorized as finishing last for exhibition events (these entrants shall be ranked only in the rankings for that event, and not commingled with LPFs). 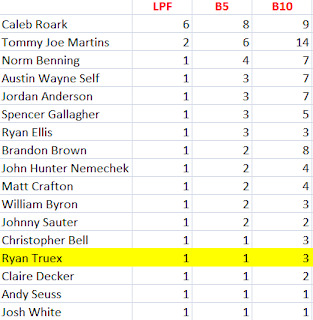 In the rare event where official results or a preponderance of unofficial results are later updated with more accurate information about who was the LPF for that event, LASTCAR rankings and statistics shall be updated to reflect that change. I am an author, journalist, and NASCAR historian who has followed professional stock car racing - and its underdogs - since 1991. This is an unofficial NASCAR website. All articles, original art, and other entries are (c) Brock Beard. All car photos were captured from SPEED Channel, Jayski, FOX, ESPN, and TheHotLap.com, or their credited source.